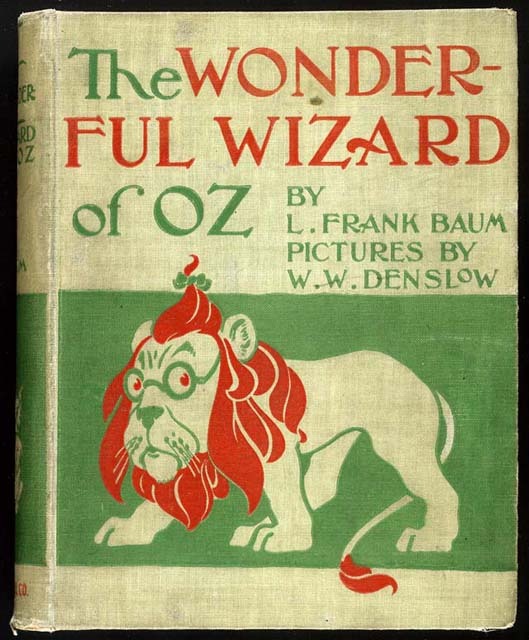 Baum’s Wizard of Oz, now over a century old, varies from its popular representation in a fashion very similar to the manner in which all works of stage and screen vary from their literary counterparts. The book features much the same cast, complete with scarecrow and tin man and lion, but offers a bit more depth and back story than the movie classic. I will not attempt to summarize the work entirely but will point out a few key points and differences that struck me as interesting during my brief perusal. No warranty is expressed or implied as to my own reader’s interest in anything I may commit to paper. Everything truly is most painfully drab until Dorothy finds herself in the most radiant land of Oz. Baum’s words of introduction could not be more perfectly reproduced than by the movie almost 40 years later. From here the text and my analysis of it settle down a bit. The good witch of the North who visits Dorothy in the opening of the text is, in fact, old rather than young and radiant as depicted in the movie. She is not Glinda, as Glinda lives in the south and has become powerful enough to defy the passage of time. Dorothy’s new-found shoes, lately belonging to the wicked witch of the east, are in fact silver, not red. As the movie folk-lore tells it, they were to originally be of silver in the movie, but were changed to red so they would contrast more spectacularly with the yellow road of such pivotal importance. I will not burden the reader with the myriad of differences in evidence. A constant conflict boils just under the surface as to whether wisdom or compassion or selflessness are most important attributes in humanity. The man of tin is given a sad and macabre back story in the book that would terrify children if it were reenacted. He retells the story briefly in chapter five in which he was the victim of love and the wicked witch of the east. The tin man’s history makes him a much more complicated personage as we realize that unlike the scarecrow, he has firsthand knowledge of what he has lost. He was once a man in love, but fell victim to the heartlessness of another. Oz isn’t so much a reality as it is an enforced state of mind, an illusion perpetuated by Oz himself. If one were in a more cynical mood, one might extend this analogy to all of government. But since one is not of such a mood, one will merely leave such concepts as an exercise for the reader, and perhaps refer them to some Orwell. Most interesting to me, we also learn the reason why the flying monkeys find themselves in the service of the wicked witch of the west. To shorten an otherwise interesting story, let it merely be said that they were a free and independent people under the influence of an enchantment which required them to serve the witch a prescribed number of times in a manner of her choosing. Later they find themselves in the service of both Dorothy and Glinda, but like all points of real interest, this is left as incentive to the reader. One of the things that is most keenly lost in the visual rendition of Baum’s work is his word play. While the Wonderful Wizard of Oz is not the best example of Baum’s love of Pun, it does display itself. Most prominently it appears in his gifts to the three non-human heroes. To the scarecrow he endows a head full of bran and needles. The “bran-new brains” include the needles to prove just how “sharp” the scarecrow has become. While Baum’s puns are many, no promise is made as to their quality. To the tin man he endows a simple heart made of cloth and stuffing and to the lion he gifts a stiff belt of whiskey to endow courage. One finds it difficult to imagine how this last gift was lost from the movie version. All in all, the book was as entertaining as the previous three times I’d bothered to peruse it. No grand discoveries were to be made but it is a quick and simple read for those that find themselves in environments where distractions made more detailed reading impossible. While it is written for a child, the age of the work makes it at least somewhat amusing for the more sophisticated reader. Children of the current era will find little in it to amuse them.